Received: October 10, 2018; Published online: December 31, 2018. C1q/TNF-α–Related Protein 1 (CTRP1) has recently been shown to act as a blood pressure regulator, as it induces vasoconstriction. In the aorta, CTRP1 facilitates recruitment of angiotensin II receptor 1 (AT1R) to plasma membrane, through activation of the AKT/AS160 signaling pathway. This leads to activation of the Ras homolog gene family (Rho)/Rho kinase (ROCK) signaling pathway, resulting in vasoconstriction. Accordingly, mice overexpressing Ctrp1 have hypertensive phenotype. Patients with hypertension also display higher circulating CTRP1 levels, compared to healthy individuals, indicating that excessive CTRP1 may affect development of hypertension. Conversely, CTRP1 is regarded as an ‘innate blood pressure modulator’ because CTRP1 increases blood pressure under dehydration to prevent hypotension. Mice lacking Ctrp1 fail to maintain normotension under dehydration conditions, resulting in hypotension, suggesting that CTRP1 is an essential protein for maintaining blood pressure homeostasis. In conclusion, CTRP1 is a novel, anti-hypotensive vasoconstrictor that increases blood pressure during dehydration-induced hypotension. Hypertension is a serious public health problem, affecting approximately one-fourth of the adult population of industrialized countries. Even with our present understanding of the pathophysiology of hypertension, most patients are classified with essential hypertension because of unclear etiology in approximately 90% of cases (Carretero OA et al (2000) Circulation 101, 329–335). Thus, uncovering the regulatory mechanism of blood pressure is required to discover a new therapeutic target for development of anti-hypertensive drugs, as well as to better understand physiology of the circulation system. In 2008, Jeon et al reported that secretory glycoprotein C1q/TNF-α–Related Protein 1 (CTRP1), belonging to the adiponectin family, is a factor that can regulate blood pressure (Jeon JH et al (2008) FASEB J 22, 1502–1511). CTRP1 is expressed in glomerulosa of the adrenal cortex and stimulates production of aldosterone, which increases blood pressure through upregulation of its transcription factor cytochrome P450 11β-hydroxylase 2 (Cyp11b2). Also, clinical analysis has shown correlation between CTRP1 and blood pressure disorders, as patients with hypertension have increased circulating CTRP1 levels compared to normotensive individuals (Jeon JH et al (2008) FASEB J 22, 1502–1511, Pan X et al (2014) PLoS one 9, e94478, Han S et al (2018) Circ Res 123, e5–e19). To dissect the physiological function and molecular mechanism of CTRP1 in regulation of blood pressure, CTRP1 transgenic (CTRP1 TG) and inducible knockout (CTRP1 KO) mice were generated, since conventional CTRP1 KO mice showed embryonic lethality. CTPR1 TG mice were hypertensive while CTRP1 KO mice had a hypotensive phenotype, indicating that CTRP1 positively regulated blood pressure. Structural abnormalities in cardiovascular and renal systems are not likely to be the cause of increased blood pressure by CTRP1 because only aged-CTRP1 TG mice showed anatomic and functional alterations of the heart without changes in levels of plasma/urine electrolytes and hematocrit. It is likely that life-long hypertension in CTRP1 TG mice induces structural changes in cardiovascular tissues. Interestingly, these anatomical changes in aged-CTRP1 TG mice are similar to those observed in patients with chronic hypertension, suggesting the CTRP1 TG mouse model could be applied as a human hypertension mimicking rodent model. Although CTRP1 does not affect the vascular structure, CTRP1 directly influences vascular tone, which confers the balance between relaxation (vasorelaxation) and contraction (vasoconstriction) in vascular smooth muscle. Thoracic aortic ring contraction assays revealed that CTRP1 induces vasoconstriction. This result indicated that CTRP1 is a potent vasoconstrictor, and this is the likely mechanism by which CTRP1 increases blood pressure. Vasoconstriction is exerted by phosphorylated myosin light chain (MLC), which induces cytoskeleton reorganization. The Ras homolog gene family (Rho)/Rho kinase (ROCK) signaling pathway upregulates MLC phosphorylation (Amano M et al (1996) J Biol Chem 271, 20246–20249). CTRP1 treatment increased MLC phosphorylation in vascular smooth muscle cells (VSMCs) followed by activation of Rho/ROCK. Consistent with results in VSMCs, CTRP1 TG mice showed increased aortic ROCK activity and MLC phosphorylation, whereas CTRP1 KO mice showed reduced aortic ROCK activity and MLC phosphorylation. Furthermore, administration of ROCK inhibitor, Y-27632, alleviated the hypertensive phenotype in CTRP1 TG mice, indicating that CTRP1 increases blood pressure through Rho/ROCK-mediated vasoconstriction. Although CTRP1 is not an angiotensin II receptor 1 (AT1R) ligand, CTRP1 activates Rho/ROCK signaling pathway by enhancing trafficking of AT1R to the plasma membrane. Administration of AT1R inhibitor, losartan, effectively decreased blood pressure in CTRP1 TG mice, and CTRP1 KO mice were less sensitive to angiotensin II (ANGII)-elicited hypertension compared to WT mice, indicating that AT1R mediates Rho/ROCK-dependent vasoconstriction by CTRP1. In VSMCs, CTRP1 treatment increased phosphorylation of AKT and its downstream target, AKT substrate of 160 kDa (AS160) which is known to facilitate the trafficking of various transmembrane proteins to the plasma membrane, including glucose transporter 4 (GLUT4) (Kane S et al (2002) J Biol Chem 277, 22115–22118) and aquaporin 2 (Jung HJ et al (2010) Electrolyte Blood Press 8, 59–65). Treatment with AKT inhibitor or depletion of AS160 using small interfering RNA suppressed CTRP1-induced AT1R trafficking to the plasma membrane and MLC phosphorylation in VSMCs. Also, CTRP1 TG mice showed increased AKT and AS160 activity in the aorta. Consistent with a previous report that CTRP1 increases trafficking of GLUT4 through activation of AKT (Han S et al (2016) J Nutr Biochem 27, 43–52), these new observations suggest that CTRP1 may have other biological functions via regulation of membrane proteins trafficking. Notably, production and secretion of CTRP1 were increased by glucocorticoids in skeletal muscle under water restriction-and diuretic-induced dehydration conditions. Additionally, CTRP1 KO mice failed to maintain normotension under dehydration conditions, resulting in hypotension. These observations suggest the basic role of CTRP1 is to prevent dehydration-induced hypotension by increasing blood pressure through vasoconstriction. It is well-known that dehydration causes blood pressure to drop, which is also known as hypotension. With other hormones, glucocorticoids are secreted from adrenal glands to increase blood pressure and maintain blood pressure homeostasis against dehydration-induced hypotension (Dampney RA et al (2002) Clin Exp Pharmacol Physiol 29, 261–268). In this study, CTRP1 has been revealed as an effector protein of glucocorticoids that restores blood pressure under dehydration conditions. Two putative glucocorticoid response elements are located between exon 1 and exon 2 of Ctrp1, further indicating that CTRP1 expression is directly regulated by glucocorticoids. Together, these findings demonstrate that CTRP1 acts as a humoral and innate vasoconstrictor to prevent hypotension during dehydration and is produced in response to glucocorticoid production (Diagram 1). Therefore, targeting CTRP1 could represent a new strategy to treat hypo- and hypertension, depending on the particular physiological condition. This study was supported by the National Research Foundation of Korea grant funded by the Korean government, MSIT (Ministry of Science and ICT: 2016R1A2B2011683 and 2016R1A6A3A11931083), and the SRC (Science Research Center) program (Cellular Heterogeneity Research Center: 2016R1A5A1011974). Fig. 1. CTRP1 expression increases in response to glucocorticoids under dehydration conditions in skeletal muscle. CTRP1 facilitates trafficking of AT1R to the plasma membrane through activation of AKT/AS160 signaling pathway in vascular smooth muscle. Subsequent activation of Rho/ROCK signaling results in MLC phosphorylation and vasoconstriction. 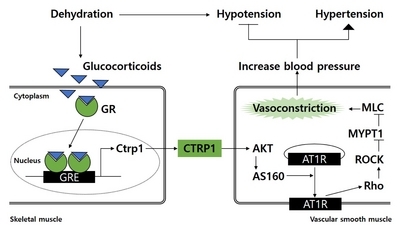 Therefore, CTRP1 induces vasoconstriction, leading to increase blood pressure. GR, glucocorticoid receptor; GRE, glucocorticoid response element.